In advance of the big game, all week long we’ll be handing over About Last Night to the stars of Super Bowl XLVIII. Today: Seattle Seahawks head coach Pete Carroll. OHHHH YES! LOOK WHO IT IS, GRANTLAND! PETE CARROLL PETE CARROLL PETE CARROLL! YES! I COULD NOT BE MORE EXCITED TO LOOK INTO LAST NIGHT’S SPORTS. THOUGH IF I’M BEING HONEST, THE NIGHTS HAVE REALLY BLED TOGETHER SINCE THE PLAYOFFS STARTED MOSTLY BECAUSE I HAVE NOT SLEPT AND I DO NOT PLAN TO SLEEP UNTIL A COUPLE WEEKS AFTER THE SUPER BOWL. ALSO, I DON’T TYPE BECAUSE TYPING MEANS SITTING, SO I’M YELLING THIS AT MY COMPUTER, WHICH IS HOW I WROTE MY LIFE MANUAL, WIN FOREVER: LIVE, WORK, AND PLAY LIKE A CHAMPION. LET’S GO! • How about that Slim Reaper? Man, is anyone better than Kevin Durant these days? 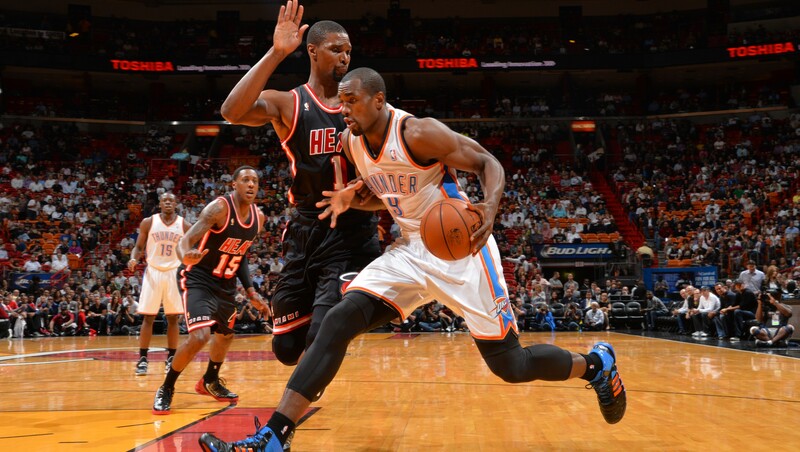 Guy led his awesome Thunder team (sorry, 12th Man) to a 112-95 win over LeBron and the Heat. That reminds me of back when I was at USC, I went to an NCAA tournament game where the Trojans basketball team beat Texas in the round of 32 even though Kevin Durant was playing. Remember that, America? Remember when Rick Barnes didn’t make the Sweet 16 with Kevin Durant on his team? AMERICA, PETE CARROLL IS SAYING THAT RICK BARNES DIDN’T MAKE THE SWEET 16 WITH KEVIN DURANT ON HIS TEAM! • Freshman phenom Andrew Wiggins put up 29 points as Kansas held off the Iowa State Cyclones, 92-81. Freshman phenoms, now that’s one thing I do not miss about coaching in college. We once brought in a recruit, and I’m not going to say who it is, but the kid had all the talent in the world. NFL people would tank a season to get him on their team, like they’re talking about doing with this Wiggins kid in the NBA, and I’m not gonna say who the kid was, but he could have been the best. But this kid, he doesn’t want to compete all the time. And I’m not going to say his name, but he didn’t believe he was going to win forever. He has the wrong philosophy about life. He wouldn’t focus in practice. And I’m not going to tell you who this kid was, but it was Mark Sanchez. • Strange story here: Braves legend Chipper Jones used a four-wheel ATV to rescue current first baseman Freddie Freeman from his car in the midst of Atlanta’s recent snowstorm. Now, did you know that Pete Carroll once saved John David Booty from a “snowstorm” at a rager at USC’s Phi Delt house on game day? And I’ll tell you, I didn’t use an ATV. I just sprinted over, yelled, “I’M PETE CARROLL” into the great room, threw J-Booty over my shoulder, and ran him straight to the Coliseum where, JD, bless his heart, led our team to a 47-14 win over Washington State. THAT’S WHY YOU ALWAYS COMPETE! PETE CARROLL! • Congratulations are in order for the Arizona Wildcats, who knocked off Stanford, 60-57, to keep their perfect season alive. That said, I would’ve liked to see the Wildcats really open up and run the score up on Stanford. I mean, what’s their deal with not running up the score? Oh, would that be unsportsmanlike? To run up the score when Stanford is involved? It would? WELL I GUESS SUDDENLY EVERYTHING IS COMING UP PETE CARROLL! VINDICATION! PETE CARROLL! • Manchester City beat Tottenham Hotspur, 5-1, to move to the top of the English Premier League. Now, I’ll be honest with you. Between typing that first sentence and these sentences I got a little bored because European soccer isn’t my game, but I challenged myself to be inspired anyway. So I invented a new way of getting my heart rate up, which I call the Pete Carroll Hotspur, or PCH. See, I don’t know what a Hotspur is, but I know that hot is a type of temperature, and spur is a sharp thing you put on your boots if you’re a cowboy. So I took a picture of Cowboys owner Jerry Jones down to my sauna, and let it melt onto the soles of my feet. Then I ran until his face was gone. This took about 40 minutes of barefoot running over coarse surfaces, which I feel has really made me into the man I am right now. PETE CARROLL HOTSPUR! JERRY JONES’S FACE WAS ON MY FEET! FEET CARROLL! • The New York Rangers won their second outdoor hockey game of the season, this time beating the Islanders, 2-1, at Yankee Stadium. Now, I don’t want sound like a conspiracy theorist, but has it ever occurred to you that it’s a little TOO CONVENIENT that the Islanders were the home team in this game? And yet the game was played in the Bronx, which is the only part of New York that isn’t an island? I’M NOT SAYING THAT THIS GOES ALL THE WAY TO THE TOP, BUT I DEMAND A REVERSE MEDIA DAY IN NEW YORK: PETE CARROLL DEMANDS ANSWERS. • The Sharks fired 59 shots at Ben Scrivens but came away with no goals as the Edmonton Oilers beat San Jose, 3-0. Now, this score line made me rethink a lot about life. Being a shark is an important middle step on my Win Forever Pyramid, because sharks are always moving, and also they can’t drown because they breathe water. So, you tell me a team of sharks is firing 59 shots on goal, and I’m telling you that they are competing and that they are bound to win forever. So what’s going wrong in San Jose? I can’t figure it out. And then, BOOM, it hits me: Sharks can’t know they’re going to win forever because they don’t have big enough brains. Because they’re sharks, not humans. It’s not just about going after the blood in the water, it’s about knowing that you’re going to devour the source of that blood, because you’re human. Also, and this is key, a human can figure out if the blood is some sort of trick being played by a National Geographic film crew or Peyton Manning. WINNING FOREVER IS BOTH A METAPHOR AND LITERALLY A THING I PLAN TO DO BECAUSE PETE CARROLL CANNOT BE KILLED. PETE CARROLL IS ALPHA AND OMEGA. PETE CARROLL EXISTED BEFORE TIME ITSELF. PETE CARROLL!